We have been selling hen house door controllers now for a few years: hen house door controller. Nothing too complicated, just a programmable timer or light detector based controller to turn a motor in one direction in the morning to open the door, and then turn the motor in the opposite direction in the evening to close the door. We have always recommended using motor car windscreen wiper motors for this application as they are cheaply available, robust, strong, and reversible. But, they are also large, heavy, different motors have different power/current requirements, and they all use far more power than is ideal for this project necessitating big relays and thick cables. After much searching and testing we have finally found an alternative motor which we are happy to recommend for this application. It is a good quality motor fitted to a sturdy gearbox giving a high torque (120 N.cm) low speed (30 RPM) which is perfect for slowly raising a lowering a hen house door. These motors are priced from £5-8 delivered (from HK / China), so they are also economical too. 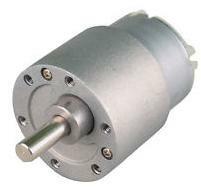 Click here for more information: 30 rpm high torque 12V geared motors. There are many other uses for these low power high strength motors which we’ll be exploring soon.